In this week when S. A. Wickremesighe is being remembered, we must remember Doreen Young Wickremasinghe as well. Doreen Wickremasinghe was a British leftist who became a prominent Communist politician in Sri Lanka and a Member of Parliament (MP). She was one of the handful of European Radicals in Sri Lanka. 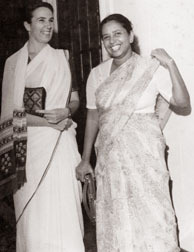 Doreen Wickremasinghe was the daughter of two British 'ethical Socialists'. While a student in London in the 1920s, she became involved in the India League and carried out other anti-imperialist work. Here she met Dr S.A. Wickremasinghe, then a radical Sri Lankan moving in Communist and radical circles while a post-graduate student in London. Dr Wickremasinghe offered to find her a job in Sri Lanka. 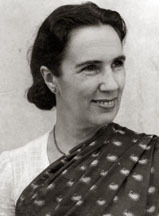 She became the principal of a Colombo girls' school, where her work on the curriculum included replacing British history with Sri Lankan and world history, and permitting the teachers to get qualified, moving the school away from its emphasis on 'training for wifehood'. During this period she learnt Sinhala. In 1933 she wrote an article, The Battle of the Flowers which appeared in the Ceylon Daily News and exposed the absurdity of forcing Sri Lankan schoolchildren to purchase poppies to help British veterans at the expense of their own, which caused her to be vilified by her compatriots. This was the beginning of the involvement of the South Colombo Youth League in the revival of Suriya-Mal Movement on a new anti-imperialist and anti-war basis. The movement, which both opposed school pupils' compulsory participation in Poppy Day, and offered yellow Suriya (Portia tree) flowers for sale as an alternative , posing the question, 'whose need is more dire, the ex-servicemen in England or the poor of this country?' Doreen was elected first President of the Suriya Mal Movement at a meeting held at the residence of Wilmot Perera in Horana. Terence de Zilva and Robin Ratnam were elected Joint Secretaries, and Roy de Mel, Treasurer. 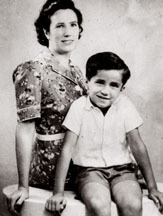 Yearly until the Second World War, young men and women sold Suriya flowers on the streets on Armistice Day in competition with the Poppy sellers. The purchasers of the Suriya Mal were generally from the poorer sections of society and the funds collected were not large - part the Proceeds were used to educate a girl from the depressed Rodi caste. But the movement provided a rallying point for the anti-imperialist minded youth of the time. An attempt was made by the British colonial authorities to curb the movement's effectiveness through the 'Street Collection Regulation Ordinance'. After marrying Dr SA Wickremasinghe, she took up another post as principal of another girls' school, where her work included promotion of Sri Lankan arts, and teaching Asian poetry. 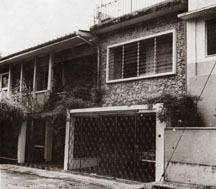 After many more years of the couple's campaigning, Dr Wickremasinghe was jailed for sedition in 1939. 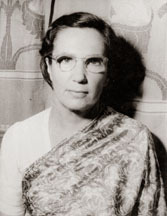 In 1952 she was elected to Parliament as Communist Party of Ceylon (CPC) member for the Akuressa seat, beating C. Wijesinghe of the United National Party.